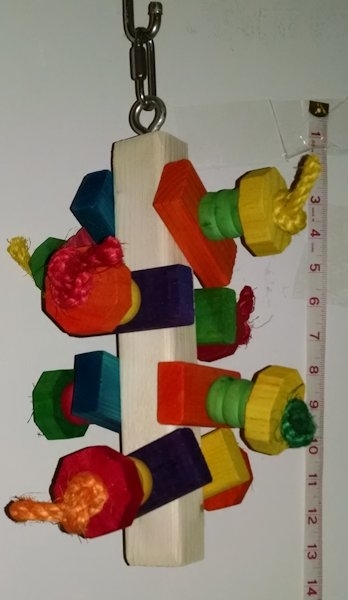 12-inches of wood to chew -- 10-inch long pine stack with blocks and barrel beads and hex blocks, strung with colored sisal rope. What large bird wouldn't want to find something to chew on this one? Wonderful toy. My umbrella cockatoo (age 20) LOVES it. Toy is very sturdy and has lasted two weeks already, with another two weeks in in is my best guess. Well worth the money.